So I finished the year with a bit of an experiment… and because I like doing two things at once it was a spacing and a felting experiment! 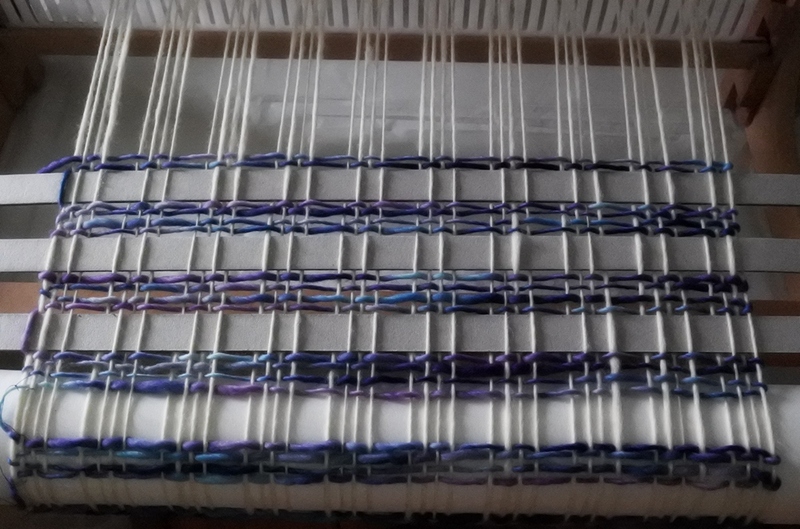 It started with my wondering what would happen if you wove a course web with spaces in the warp and weft. 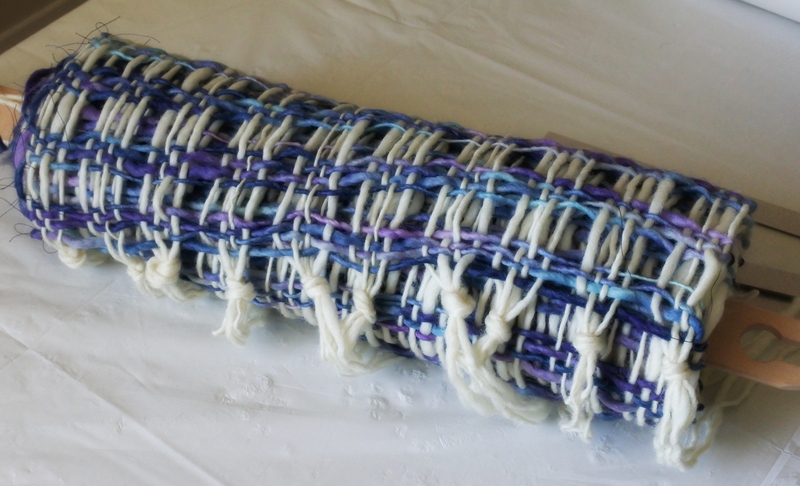 Would the yarn spread out when you fulled it to fill the spaces? I had a theory it would, but how evenly? Obviously I didn’t want to have the same problem with the final cloth and that was why I decided to felt it lightly, so the web wouldn’t deform. 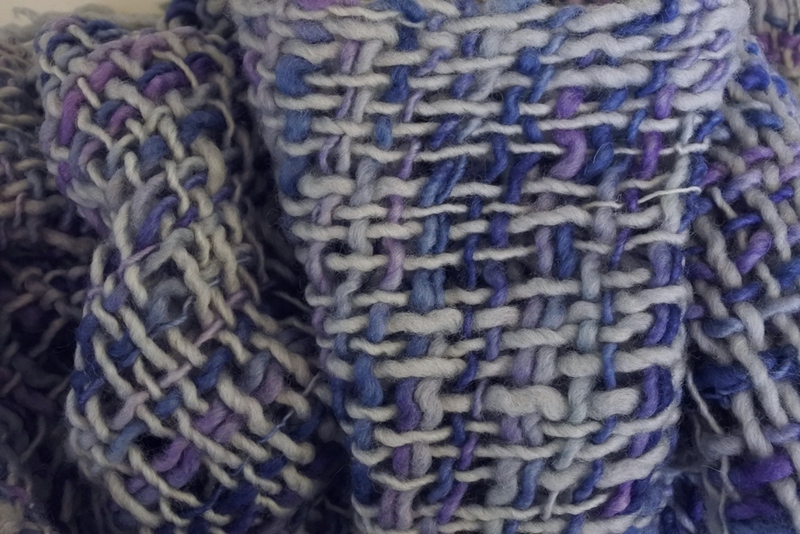 You’ll also notice that the cream yarn went blueish. That’s because I decided the gentlest way to felt it was to boil it and that meant the dye spread itself around a bit! I was pleased with the final cloth, which is rough and squiggly but quite even. The felting might need to go just a bit further, but overall the yarn is sticking in place nicely. The only disappointment was how dull the colours are now… the dying of the cream gives it a dullness – the heat may also have affected the dyes and dulled them – so it’s not as pretty as I might have liked. Still, I like the end result. Once I’ve finished it properly, I’ll do a post showing the final web in all its glory. Felting is a remarkably simple process, though it does take time and therefore requires some patience. You also can’t undo it, so once your wool begins to felt you need to keep a close eye on it. The essentials of felting are that you need something made of wool, some hot water and a way of agitating the piece. Very simple. Some people put their wool into a pot and boil it, letting the bubbles do the agitation. Others put it in a bucket with the hottest water their hands can take and stir it. For more delicate felting you can apply hot water and then rub it by hand, with or without the addition of exfoliating gloves (or mesh like in the nuno method). Oh, if you have the right kind of washing machine then you can felt that way too. The basic formula for felting though is the hotter the water the less agitation required and the faster things move, but if boiling it appeals, remember that dyes can leach out and may not be great to breath! Also, you need to fish the wool out of the pot all soggy and dripping scorching water. If you’re me that probably means burns. Whatever the method, it takes a while before anything starts to happen (the first sign is that the cloth will get looser). Once it does, the felting can happen quickly. The degree of felting you want will take a little practice to achieve, but the main thing to avoid is taking it too far when it’ll start to fall apart (or so the interwebs tell me). How do you know when it’s actually felting? 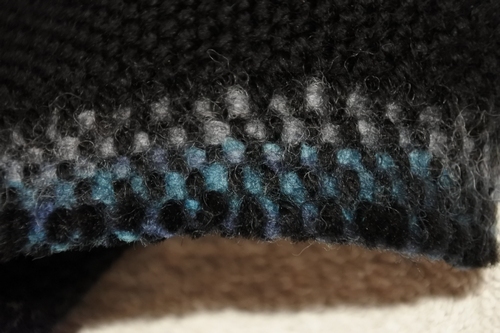 It’ll get a bit fluffy on the surface and visually the weave will start to blur. Though that’s just the start. Really that’s it. Well, you do need to keep in mind that felting will cause the cloth to thicken and the further you take it the stiffer it will get. Of course that thickening also means it shrinks quite significantly (30% + isn’t unusual) and this is proportional to how far you take the process (thicker felt = higher shrinkage). Not sure how much more felting I’ll do, but I enjoy thinking of it as extreme fulling! I should start by admitting that I’m not a huge fan of things made from felt, but when you engage in the washing of wool there’s just a natural segue into a bit of felting. My first attempt wasn’t a very big piece and for a while I wasn’t even sure it was going to work! The great thing about the felting process though is that if it’s not looking felt-y you can dunk it again and keep working on it. Kind of cool, no?